When you start, are you able to cancel the Initializing dialog? You should be able cancel it during the "Examining Libraries" part. the "cancel" button is greyed out though, but I can cancel it. 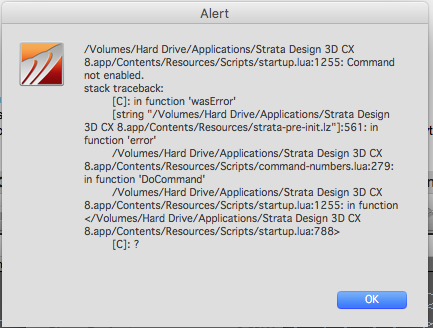 /Volumes/Hard Drive/Applications/strata 3D CX 8.app/Contents/Resources/Scripts/startup:lua:1255: Command not enabled. On this new partition, yes. But do I need to cancel the "libraries" dialogue each time I start up? I don't mind doing it as long as I don't get more problems down the road. I've passed this onto the developers. What it will do is just not let you have access to the built-in libraries. But it shouldn't prevent you from using your own files. Okay, I think I got that same character feature as well. which are those built-in libraries? And thanks for the fantastic help!!! The Resource palette has a bunch of textures, models and other presets which can be accessed quickly through the libraries button. 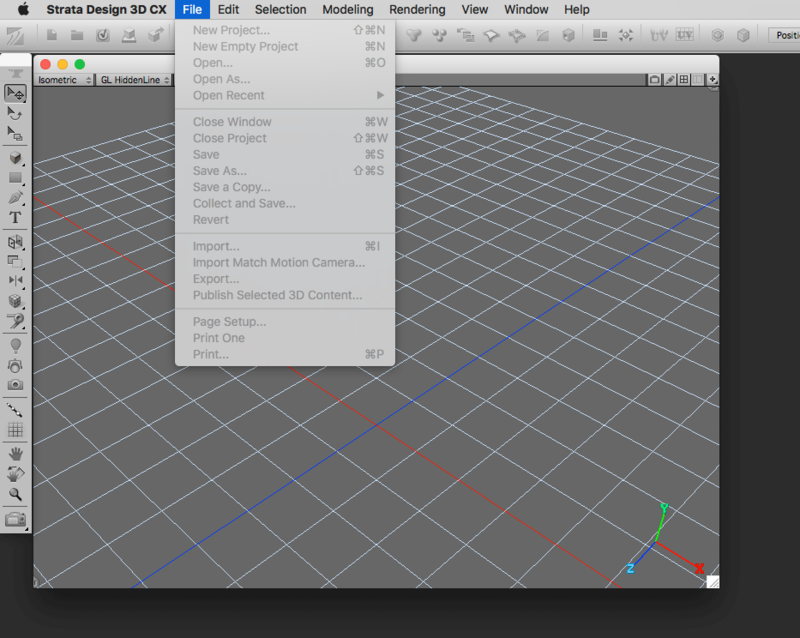 Most of them I never use, but occasionally there are some animation scripts I will use. So for me canceling that scanning pass never causes a problem because I don't use the those built-in resources. Any resources you create as part of the file creation process are saved in the file itself and so you should always have access to those. If you have used any of the built in resources in the past in a project, they will become integrated into the file and so canceling wouldn't affect those items. My suspicion is that this might have something to do with OS X 10.11. I still am using 10.10. I don't use the built in resources so I will be good in that regards. Try re-running the Strata Updater on your CX 8.1.1 application. I suspect that something didn't update properly. You might also want to restart the computer to clear things out of the system caches. Sorry, that suggestion was to try and help with the alert you reported. Do you have a large set of custom libraries? If you do then those and the built in Resource Libraries can take longer to load. Canceling the libraries scanning pass won't effect the use of the app, it will limit the resources available in the Resource Palette though. No, I have no custom libraries that I know of. All that came with the installation I got and then for my current model I have 14 textures. Chris suggested the cancellation of the loading of the resource lib, I do that and it works just fine. Possibly a bad file in the Resources Library? could very well be, how to check for that? 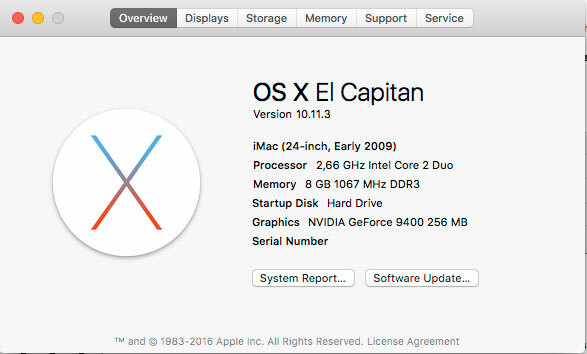 You could try resetting preferences, repairing permissions (10.10.x and earlier) and restarting the computer. These steps have resolved some strange issues. What is the speed of your hard drive? If a 5400rpm drive, then that is probably going cause the library loading to be slow. Will check the drive's speed. But this afternoon I installed an SSD into my laptop which has also a new OSX. This SSD is now rendering 1 model so I have to wait for this to finished and then I restart Strata again and clock the lib loading speed. But I got a deadline this night so perhaps I got the data tomorrow. All in all, I can live with this. My only concerns was that this is not something that slowly degrades into a worse and worse performance. Again thanks for the responses, feels good to have people read the questions and help.